The last week has been spent at home dying, surviving, and recovering from flu. I really cannot remember the last time I have felt so ill, and I literally curse whoever gave it to me in my office… It’s so hard to avoid things like this when you work in an office all day, copious amounts of ginger tea and constantly spraying your hands with antibac isn’t always a fail safe protection. I’m still exhausted, and have a whooping cough, but I’m over the worst of it, and I literally cannot wait to be able to get back to doing normal things like going outside, wearing makeup and dare I say it, going back to work! I luckily managed to get these pictures 2 weekends ago whilst I was still well, this is one of my favourite work outfits at the moment. It’s smart but super cool and casual at the same time. Cigarette trousers are an instant style win, I love their flattering shape and where they come up short on the ankles makes room for a pretty impressive pair of shoes, I think these pom pom flats tick the box! 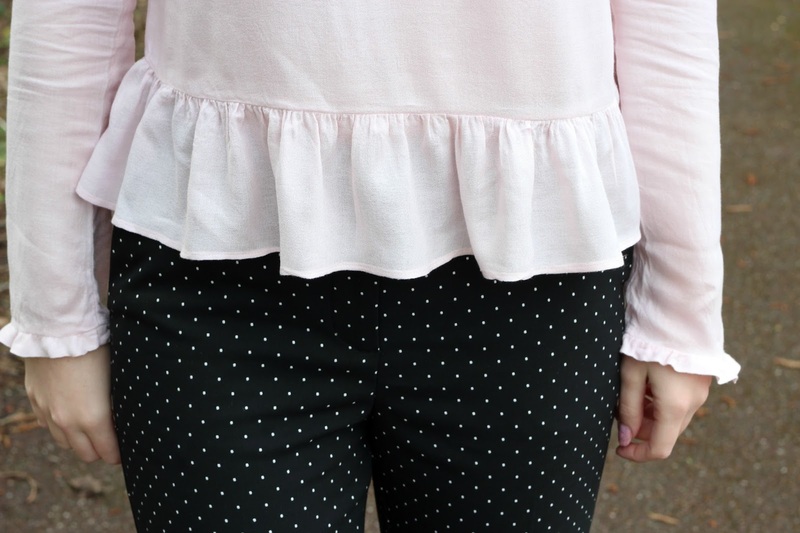 It’s difficult to know what to wear with trousers like these to execute the look perfectly, I find shirts and floaty blouses like this perfect, I had to inject a bit of blush pink with this look which makes the polka dots pop on the trousers. I wear this top for normal casual wear too as it’s the prettiest colour, and it has the cutest floaty sleeves!